EcoVelocity low-carbon motor festival at London’s Battersea Power Station. compete in the ‘Sports EV’ classification of the series which gets underway in November in California. eco-friendly metal which will be on display at the show’s green supercar paddock. on the 17th December before a full series launch in 2012.
on a specially-constructed circuit in the shadow of the famous power station. 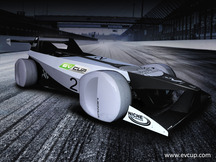 totally around zero-emission electric cars, providing the platform for sustainable motorsport. styled by upcoming designer Elliott Hawkins from the Royal College of Arts. as providing test drives on a specially-constructed circuit in the shadow of the famous power station.